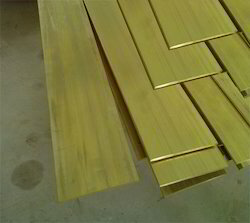 We are a leading Manufacturer of brass pipe and brass flat bar from Mumbai, India. Our client centric approaches help us to provide best range of Brass Pipe plumbing applications. Our products are highly reliable and are manufactured from the highly qualified team. Our products are strong, leak proof, well tested and are distributed to various clients. They are made of pure brass metals and are highly sustainable. We offer these advanced ranges of products at nominal price range. Size 3/4" x 1/8", 1.1/4 x 1/2", 3 x 3/4"
We are manufacturing and supplying a high quality range of Brass Flat Bar in wide varieties of sizes. They are highly sustainable and are purchased for various essential works. Our quality is superior and all our products are sourced from the certified vendors. All our products are high in demand and are provided to several clients at the most competitive price range. Looking for Brass Pipe ?